July 28, 2001 was a warm summer evening in Stockton, California. About sixty friends and family members assembled in a public park and sat on folding chairs. Nearby, young children were playing catch and riding bikes. The people came to honor the memory of Robert Wendland who died on July 17, 2001. Robert's 78 year0-old mother Florence and four of his siblings sat in the front row. Noticeably, but not unexpectedly absent, were Wendland's wife Rose and their three children. Eight years earlier Robert Wendland had been in a severe motor vehicle accident. After 16 months he pulled out of a coma, but the accident left him with extensive brain damage. He could do limited activities such as operate a motorized wheel chair and write the letter "R" as well as some other letters. In 1995, his wife Rose sought authorization from a California court to have his feeding tube removed, an act that would have brought about his death by dehydration and starvation. When Wendland's mother and sisters learned of this, via an anonymous telephone call, they obtained an injunction, preventing his wife from carrying out her plan. 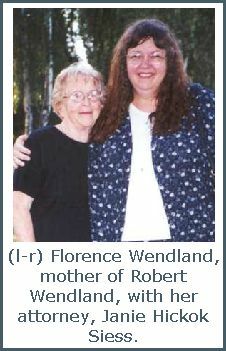 Since then Wendland has been the focus of an intense legal battle, which pitted his mother Florence and other family members against his wife. The case finally was appealed to the Supreme Court of California. 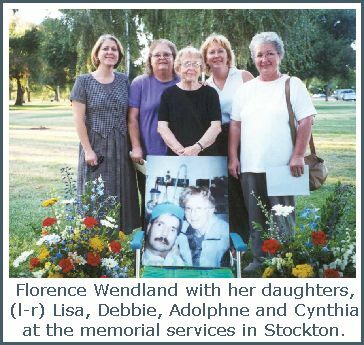 On May 309, 2001, Janie Hickok Siess, Wendland's attorney of six years, presented her oral argument to the state's highest court. In light of Wendland's death the court could have sidestepped the issue and ruled that the case was moot. However, they courageously went ahead with their decision because of the overriding significance of the issues the case presented. On August 10, 2001, just 13 days after the quiet memorial service in the park, the Supreme Court of California formally announced its decision. In a 50 page, 6-0 (unanimous) decision authored by Justice Kathryn Werdeger, the High Court ruled that a California conservator is not authorized to withdraw food and fluids from a conscious, cognitive conservatee such as Robert Wendland unless he shows by clear and convincing evidence that to do so would either be consistent with the conservatee's prior expressed wishes or in his best interest. Justice Werdeger noted that, "the importance of the ultimate decision and the risk of error are manifest. So too should be the degree of confidence required in the necessary findings of fact." Following the lead of the Michigan and Wisconsin High Courts which, in 1995 and 1997, respectively, refused to start down this "slippery slope", Justice Werdeger observed that "[t]he decision to treat is reversible. The decision to withdraw treatment is not."